Nothing says "SNOW DAY!" like a mug of hot cocoa. Yes, we finally had some snow this year, here in the greater Seattle area. Not enough to cancel school, but a dusting of the white stuff is beautiful to see. It's nice to have some cocoa mix ready for family to make a mug when they want. I make this without powdered milk added, as I like mine with a lactose-free milk, sometimes my kids like it not so rich and do half milk/half water, and sometimes they like it all milk. 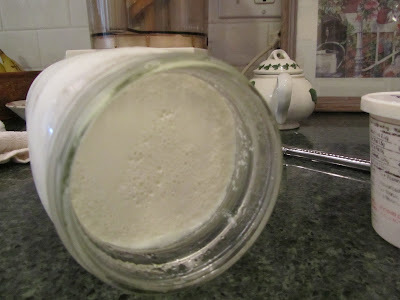 It will also work with caster sugar, superfine sugar or commercial powdered sugar (icing sugar). My homemade powdered sugar is more like a superfine sugar. It dissolves rapidly in liquid, and has no anti-caking additives. I posted about this long ago. Here's the link to making powdered sugar with a coffee grinder. This recipe makes a very rich and chocolate-y cup of cocoa. 1/2 cup homemade powdered sugar. 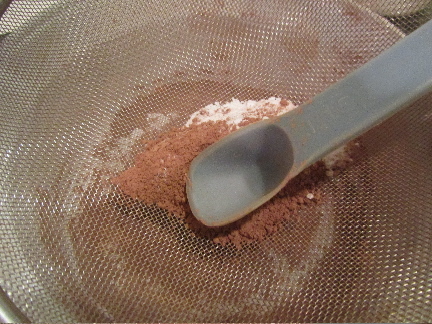 Stand a mesh sieve (strainer) over a second bowl, and with the back of a spoon, rub the mixture through the mesh. Sieving in this way blends the mix and breaks down lumps. Alternatively, you could sift the mix. pour about 8-9 oz. of milk, or half water/half milk into a microwaveable mug. Microwave for 1 minute on HI. Stir in one level 1/4 cup measure of cocoa mix. Stir well. Microwave for 30 more seconds. Stir once more. There will be a tiny amount of cocoa "sludge" at the bottom of the mug when done drinking, because it's baking cocoa and has not been processed in any way to allow complete dissolution of the powder. Our family is fine with this. For half the price of canister mix and about 1/4 the price of those little packets, we'll gladly accept a little "sludge". If you're taking this camping, or for whatever reason you will want the milk powder mixed in, you can add enough instant milk powder to reconstitute to 1 cup, to each baggie. One other option with making your own cocoa mix is that you can use artificial sweeteners, if desired. You can blend sugar and Splenda or stevia, or use straight splenda/stevia. You just want to make sure that for each cup you use the amount of sweetening as 2 tablespoons powdered sugar (about 1 T, 2 t. granulated sugar). You'll need to do a single-cup batch and measure after cocoa is mixed in, to find your own recipe measure for making a mug of cocoa. Then simply multiply your recipe by however many servings you wish to make up. Jazzing up that cup of cocoa. There are many wonderful flavorings you can add to make that mug of cocoa special. My favorite this time of year is peppermint. My kids like to stir their cocoa with a mini candy cane. You can also use a few drops of peppermint extract. Orange and chocolate seem to be a natural combination. A 2-inch by 1/2-inch piece of orange zest (use a vegetable peeler to strip a large piece from the skin of an orange), placed in the cup of cocoa just before the final 30 second microwaving, will impart a delicate orange flavor. Give it a hint of spice by studding the orange peel with 2 or 3 whole cloves. A few drops of vanilla or almond extract are also delicious, as is a spoonful of instant coffee. And of course, no cup of cocoa would be complete without either whip cream or marshmallows. My mom always put a large marshmallow into our mugs. So I'd say I'm partial to the one large marshmallow. How about you? Are you a whip cream topper or marshmallow topper? Marshmallows aren't my favorite sweet except in a couple instances--s'mores and hot chocolate. I like the mini marshmallows in my drink. Every Christmas, I have a nephew who makes and gives this mix to everyone. It's an easy gift for kids to make. What a great thing for your nephew to make for gifts. The other good kid gift to make is cinnamon-sugar in a sprinkling container, to use for cinnamon toast. I think Amy Dacyczn from the Tightwad gazette suggested that in one of her books. I'm sipping my commercially-bought reduced sugar hot chocolate as I read this, thinking, hmm, I could probably make the homemade version! We are having really rainy weather today so I'm craving comfort. Tonight and tomorrow it's supposed to change over to snow (and lots of wind--hoping for no power outages!). Hoping for a decent amount of snow so the kids can have fun during Christmas vacation! 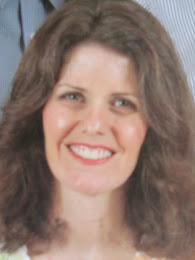 Hi Kris, I make my own reduced-sugar cocoa almost as often as I make it with sugar. I like that I can use however much stevia or splenda that I want. I'll add part sugar, as I think it tastes better that way. I could really go for a cup of cocoa right now. We were outside this evening and it was bone-chilling cold. Silly me, I didn't take a jacket, as I didn't want to look all bulky! Just wore a thin sweater over another thin sweater. Oh, my ego! I paid for it, though. Shivered myself all the way home! 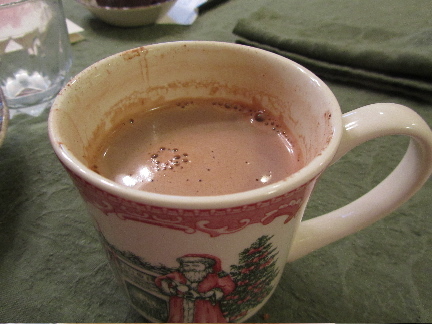 A nice cup of hot chocolate really warms me up (and makes me quite jolly, especially good for the holiday season).